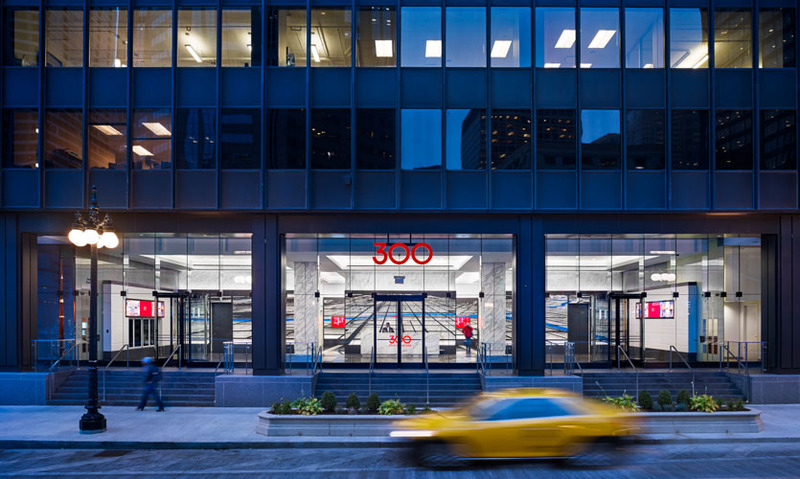 300 South Wacker Drive, a commercial office building in downtown Chicago’s West Loop, needed a new identity. ESI Design envisioned a map theme that would highlight the building’s connection to the city and the river. 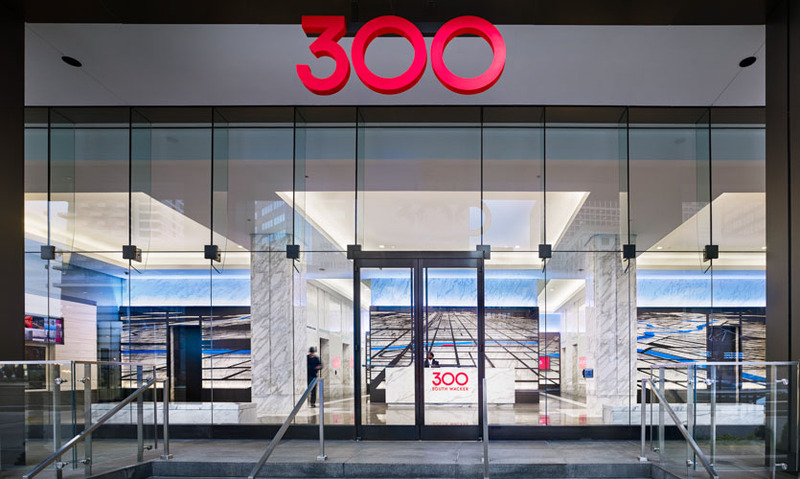 Their solution is a 40-story mural that proclaims “You are Here” on the building exterior and a bright, captivating entryway and lobby. The property is an elegant realization of mid-century modern architecture, but the building was turning its back on the river and the updates of previous renovations had become unremarkable. The lobby was out of step with the building’s original design, and the client wanted to enliven the space so it would appeal to tenants in a more dynamic way and create a strong sense of place for the property. 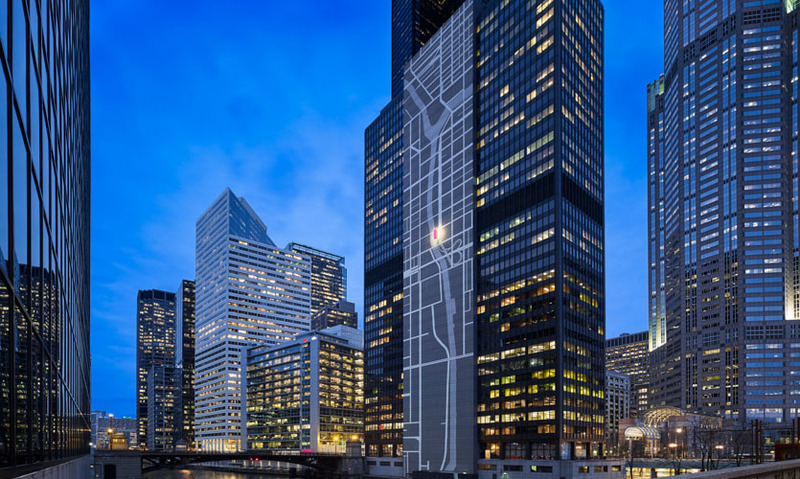 ESI Design’s approach literally puts the building on the map of downtown Chicago. 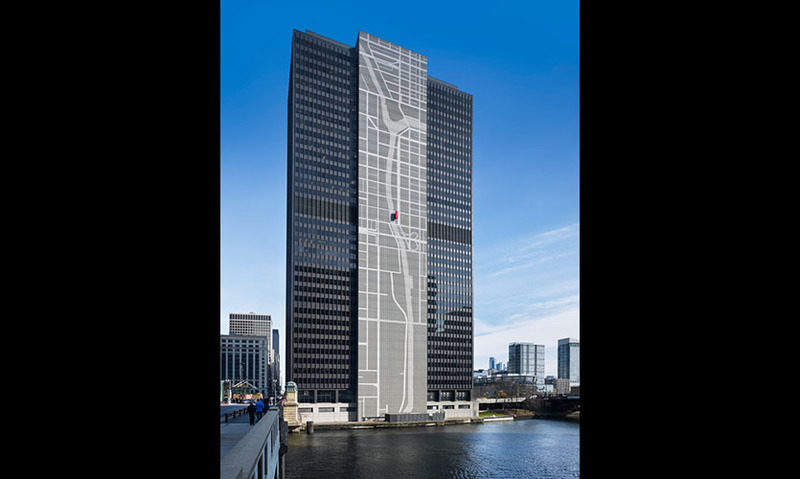 The 440-ft.-tall mural gives the building a face over the river, and has earned it a spot on the city’s famed architectural boat tour as well as in numerous media outlets including a national television piece by a major news network. While the mural’s size results in a meaningful influence on the neighborhood at an urban scale, its understated graphic approach was designed to respect the river and the surrounding environment. And while the exterior mural is the hero of the project, its design actually sprung from the original plans for a lobby mural. Aspiring to create a dramatic sightline to the back of the lobby and a dramatic appeal from the street, the ESI Design team sought to unify the space despite its obtrusive columns. They conceived a cut-metal, forced-perspective map of the neighborhood on the back wall, placing the building firmly in its urban context. 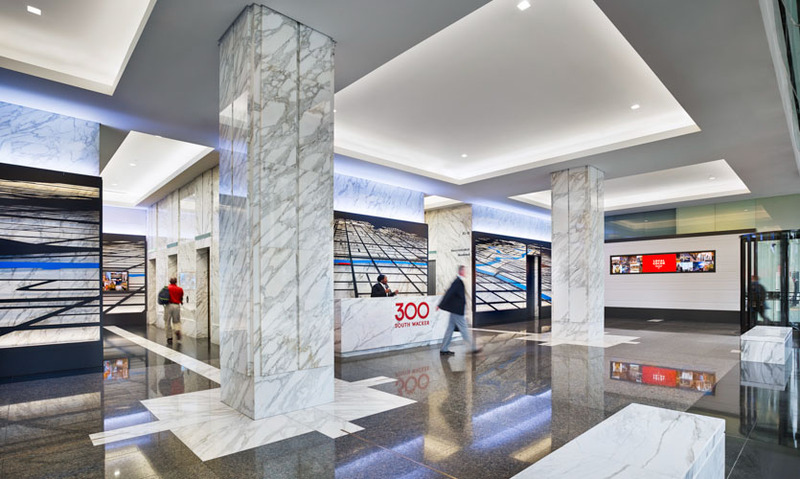 The forced perspective draws the eye farther into the lobby and makes for a more dramatic spread across the wide marble wall. The deep blue of the Chicago River weaves its way through the gray grid of the streets, and the surrounding white marble glows from hidden lighting. The map is flanked by synchronized media installations on either side and in each elevator bay, displaying a continuous loop of local content. The custom media automatically updates its graphic animations with new weather information, event listings and community-sourced images. Additionally, each installation has a building identification moment and an intermediary mode designed to visually camouflage into the physical walls of the lobby. In this way, the media disappears from time to time, drawing focus back to the metal map. Finally, new bright-red building numbers enliven the glass entryway, front desk and rear wall. The lighting package on the lobby’s white marble transforms the space into a glowing white box visible from the street both day and night. After dark, the exterior numbers glow, as does the building’s icon on the outside map above the river. 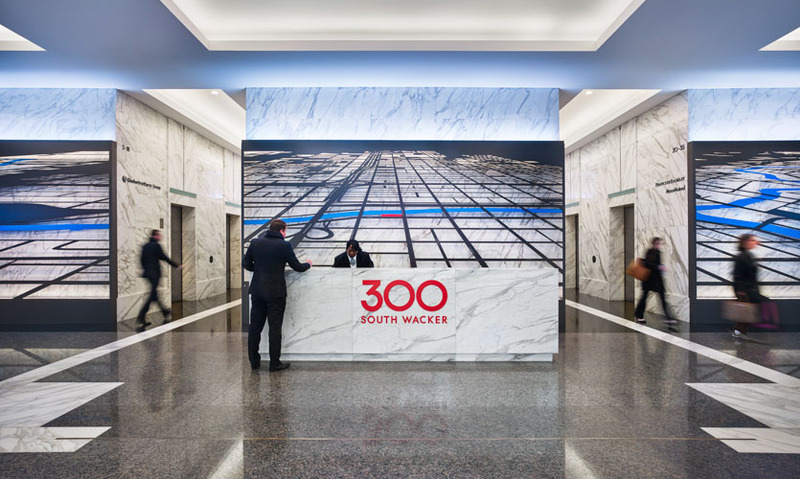 Additional tenant signage is also in the works, as the client reports that new tenants have begun to call 300 South Wacker their home—a mark of the project’s success. "Two things make this project notable. 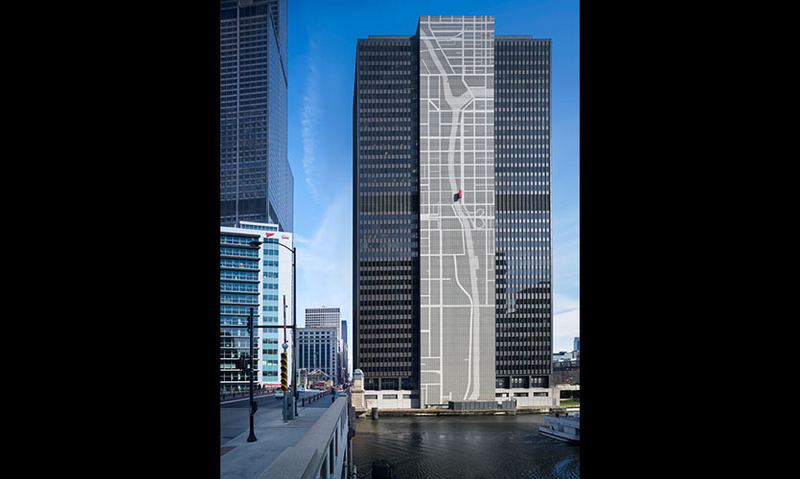 First, the use of environmental graphics to put a relatively unknown building on the map. Second, how the project reveals itself little by little until you see, finally, the delicate but bold “you are here” dot. It’s playful and delightful." "The sheer scale of the graphic on a formerly plain building façade adds an impressive, memorable landmark to the cityscape. The large civic gesture helps with navigation and gives the project a distinct identity. The use of the red “you are here” marker is referenced in the other signage and graphics to make for a cohesive identity system."